Specialized has just introduced The Turbo, a brand new electric bicycle they’ve dubbed as the world’s fastest e-bike. Designed as a “speed-focused, high-tech urban bike”, the company built The Turbo to perform as optimally as a fast-bike should, but with the extra kick of a high-tech motor. The Turbo not only has the ability to reach a top speed of 28 mph (45 kph), but its 342Wh capacity lithium ion battery can recharge in just two short hours. Users can easily remove the battery and recharge it anywhere it is convenient. Specialized designed the battery to achieve the highest possible C-rating to allow for both maximum power, fast acceleration and a reliable internal cooling system. Regenerative brakes also help recharge the battery while the Turbo is in motion. 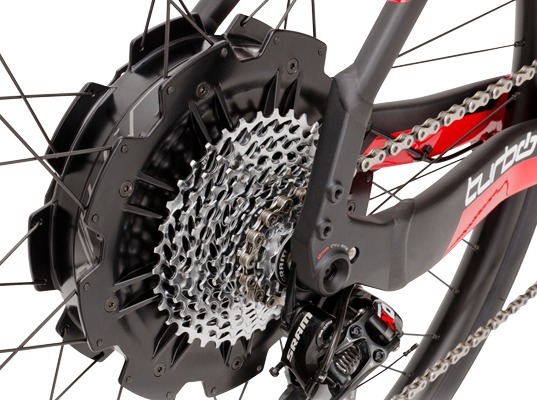 Bicyclists also benefit from a silent motor, and a fully integrated power connector for easier maintenance and rapid wheel changes. The bike’s technology also integrates with its aesthetics. 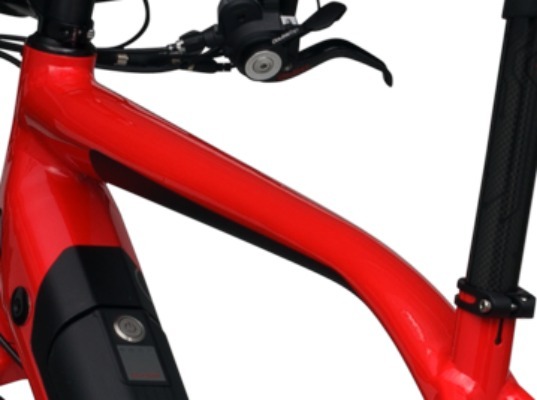 Specialized avoided the clunky design that is often the bane of electric bikes, and instead placed the battery in the slightly oversized down tube. Full internal cable routing also avoids a spaghetti-like mess of wires and cables. Other specs include an oversized alloy fork that has a tapered 1-1/8 to 1-1/2 inch steerer, and a Q15 thru-axle dropout — both of which Specialized described as sturdy and responsive, even at a maximum 28 mph speed. Brakes benefit from a MT Carbon hydraulic system with carbon levers and 180mm rotors. The Direct Drive rear hub motor offers maximum push and efficiency at full speed as well as steeper hill climbs. Techies should appreciate the wireless interface unit that displays the battery status, assist level and standard distance, speed and time. The wireless BUS system is also ANT+ compatible so it should work with most accessories while bicycling among city streets or your town’s bike paths. The Turbo is set for a May release. Australian designed "Stealth" will tear that bike apart,spit it out and do it again. It's called The Bomber. After looking around their site fruitlessly, I gave up. Price? Range? Specialized has just introduced The Turbo, a brand new electric bicycle they've dubbed as the world’s fastest e-bike. Designed as a “speed-focused, high-tech urban bike”, the company built The Turbo to perform as optimally as a fast-bike should, but with the extra kick of a high-tech motor.